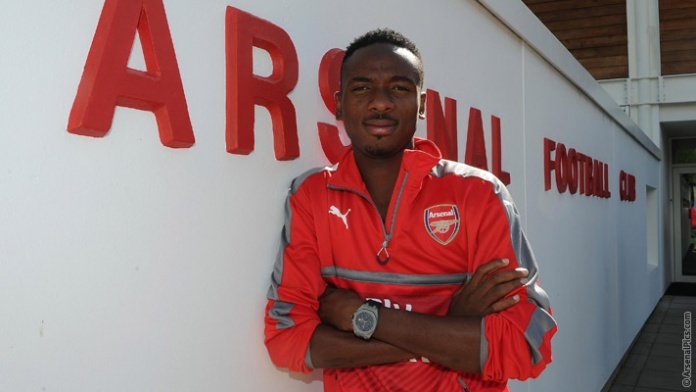 Kelechi Nwakali has finally completed a season-long loan move to Dutch club MVV Maastricht after his Dutch work permit was granted, the player’s parent club Arsenal have confirmed. The 18-year old Nigeria youth international signed a five-year contract with the Gunners in June, but has been sent out on loan to gain more first team experience in Holland. A statement on the club’s website reads: “Kelechi Nwakali has joined Dutch side MVV Maastricht on loan for the rest of the season. “The 18 year-old signed for the Gunners this summer, from the Diamond Football Academy in Nigeria.“He captained the Super Eagles (sic) to victory in the Fifa Under-17 World Cup in Chile last year, also winning the Player of the Tournament award. “With his Dutch work permit now granted, the young midfielder heads to Maastricht to gain first team experience. He will join up with new Gunners teammate Stefan O’Connor, who is also on loan with the Eerste Divisie side. “We wish Kelechi well for the season ahead.”The Gunners however registered him for their Premier League squad for the season, and he had a few training sessions with the first team before he completed the move to the Dutch side.